I reject reality and replace it with my own! Apple also has an ongoing case in Germany, part of a global intellectual property battle with Samsungin the mobile phone and tablet market. Apple has provided flawed visual evidence of similarities between the iPhone 3G and Samsung's Galaxy S smartphones to the District Court in The Hague, an investigation by Webwereld.nl, a Dutch IDG publication, has found. This time, a picture of a Galaxy S smartphone has been resized to match an iPhone 3G. But the picture Apple submitted of the Galaxy S is inaccurate and does not match the real Galaxy S. Further analysis has confirmed this assessment. The Galaxy S, introduced in The Netherlands in July 2010, is both taller and wider than the iPhone 3G. According to Samsung, the dimensions of the Galaxy S are 122.4 by 64.2 millimeters. The iPhone 3G measures 115.5 by 62.1 millimeters. 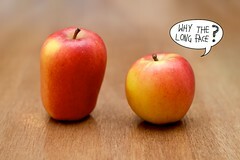 In the text, Apple confirms that the Galaxy S has "some non-identical elements, such as the slightly larger dimensions." But the picture of purported Galaxy S has been resized about 6 percent, making the Galaxy S appear smaller and more similar to Apple's phone. The height of the purported Galaxy S that Apple displays matches the iPhone exactly. The aspect ratio has not been measurably altered. Mark Krul, a lawyer at the Dutch firm WiseMen and a specialist in IT and intellectual property law, is astonished by the findings. "It surprises me that for the second time incorrect presentations of a Samsung product emerge in photographic evidence filed in litigation," he said. "This is not appropriate and undermines Apple's credibility both inside and outside the court room." Krul said that litigating parties are required by Dutch law to provide "complete and truthful" evidence to the judge, adding that this is even more imperative when infringement on design and copyrights is alleged. Krul noted a crucial difference with the German case, in which the judge granted a preliminary "ex parte" injunction, without a hearing or an opposition brief from the defendant. In The Hague, Samsung's lawyers lodged an opposition and flagged the flawed evidence. Krul doesn't presume that the examples of the faulty evidence are malice on the part of Apple's lawyers. "But Apple has certainly some explaining to do, if only to clear itself from the appearance of improper behavior," he said. Webwereld has briefed Apple and its Dutch counsel, Rutger Kleemans of Freshfields Bruckhaus Deringer, on the results of the investigation and submitted questions to clarify the issue. He declined to respond. Samsung also declined to comment, citing ongoing litigation. In the Dutch case, Apple seeks a ban on all Galaxy smartphones and tablets in the European Union (E.U), including a complete recall of stock by European distributors and resellers. The court in the Hague will rule on September 15. At the hearing last week, Judge Edger Brinkman stated that if he grants any injunctions against Samsung's products, they would take effect no sooner than Oct. 13. The court, citing uncertainties about jurisdiction, changed its ban to allow Samsung to sell the product in all E.U. countries except for Germany. The first in Dusseldorf. I would say if this happened once you could chalk it up to mis-communication or blame it on an individual lawyer gone rogue but twice? Come on now Apple. I knew they did that with the tablet but with the phone too??? What say you now Apple fan boys? I find it hard to believe the image distortion was deliberate because it is so easily disputed, and the misrepresentation is an embarrassment to Apple. Furthermore, aspect ratio is not among Apple's itemized list of infringing design elements. By the way, not specific to Samsung, I thought the following image pretty much says it all. I bet Jobs indirectly had someone doctor the photos. Apple can't stand the competition. I wonder how many other times they've done this and not gotten caught. Actually, the pic manipulation is easily proven when examined by an expert. I can usually tell when something is shopped and I'm not even a professional. The links you guys posted are silly and not substantive. Here's one that's relevant to the topic. 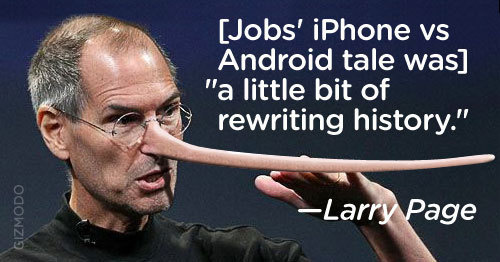 Hey, did you hear that Apple was officially sanctioned for falsifying evidence? Me neither. Another vaporous hater-trumpeted scandal bites the dust. Lol. Look at all the dumbasses who can't see a simple logical flaw from the Dutch website. Hold on guys, let me draw these red lines to show the differences in dimensions, while I put a note in grey that says "These images are only to compare the different aspect ratios, not the actual dimensions." So I'm not comparing the dimensions, but look! Clearly the dimensions aren't right!